Mr. Genest modeled for French designer Thierry Mugler during a fashion show in Paris in 2011. 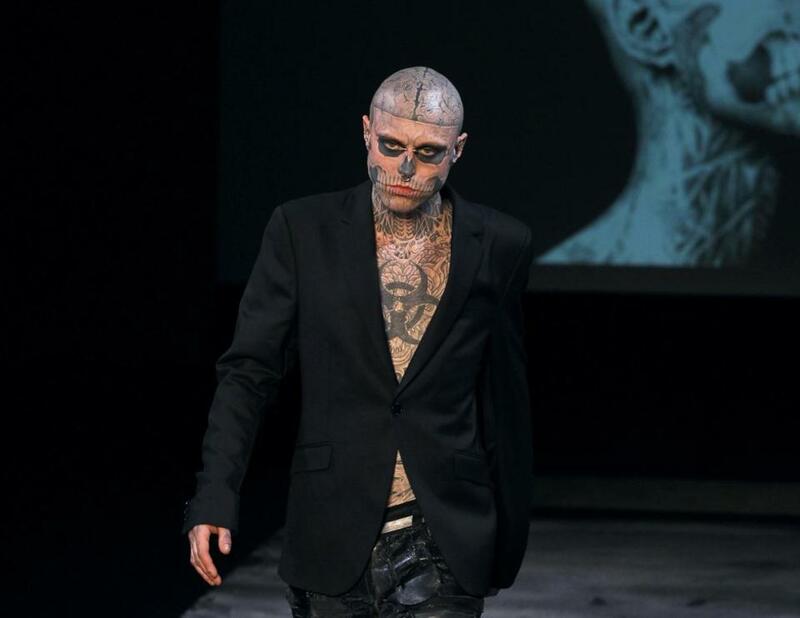 MONTREAL — Rick Genest, a Quebec model known for his head-to-toe tattoos and participation in the Lady Gaga music video ‘‘Born This Way,’’ has died, his talent agency said. According to his website, he holds the Guinness World Book of Records for the most insects tattooed on a human body (178), as well as the most bones inked on a human body, at 138. But while his outward appearance may have been intimidating, he was unfailingly mild-mannered and polite, according to the CEO of the Welcome Hall Mission, a homeless shelter Mr. Genest visited as a teen and continued to support as an adult. Sam Watts said he last saw Mr. Genest in June, when the artist lent his famous image to a campaign to raise awareness about the issues facing marginalized and homeless youth. ‘‘This was a guy who put you totally at ease,’’ he said. In early 2011, a photo of Mr. Genest in a fashion magazine drew the attention of fashion designer Nicola Formichetti, then the artistic director for French fashion house Mugler. In their scenes together, the singer sported face paint that mimicked Mr. Genest’s tattoos as the two performed to the hit song in matching black suits. Quebec’s coroner’s office said an autopsy would be conducted to determine the cause of death.